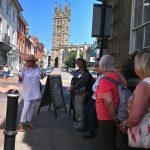 On July 7th, the Unlocking Warwick Court House Tour was conducted by Paula, a very experienced guide who was able in 45 minutes to pack-in the history of the administrative buildings at the town’s central crossroads and a brief history of Warwick itself from its founding by Aethelflaeda, The Lady of the Mercians, in 914. 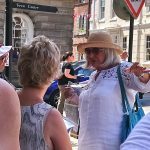 Visitors who came on this free introductory tour had come to Warwick for a day out and a visit to the Saturday market from Banbury, Kenilworth, Stratford upon Avon and Coventry. 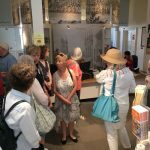 Court House Tours happen on selected Saturdays throughout the summer season. The next one will be on July 21st. There is no need to book – just turn up at the Visitor Information Centre in Jury Street in good time for an 11am start in the Pageant Gardens behind the Court House. These days there are no courts in the Court House, which is the Town Hall, Visitor Centre and Warwickshire Yeomanry Museum, with a Regency ballroom on the first floor which can be hired for a range of functions.